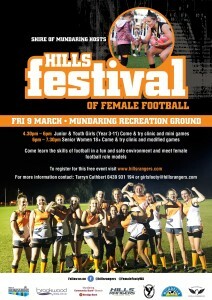 The Hills Rangers Football Club have partnered with the Shire of Mundaring, the WA Football Commission (WAFC) and Swan Districts FC to host a Festival of Female Football at Mundaring Oval. This FREE event supported by the Shire of Mundaring will host both junior and senior women for skills development and modified games. 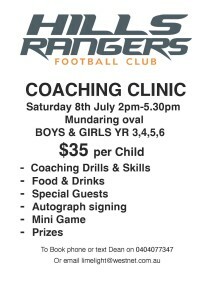 It’s perfect for anyone that wants to come and give football a go. Groups will be broken into various age categories. 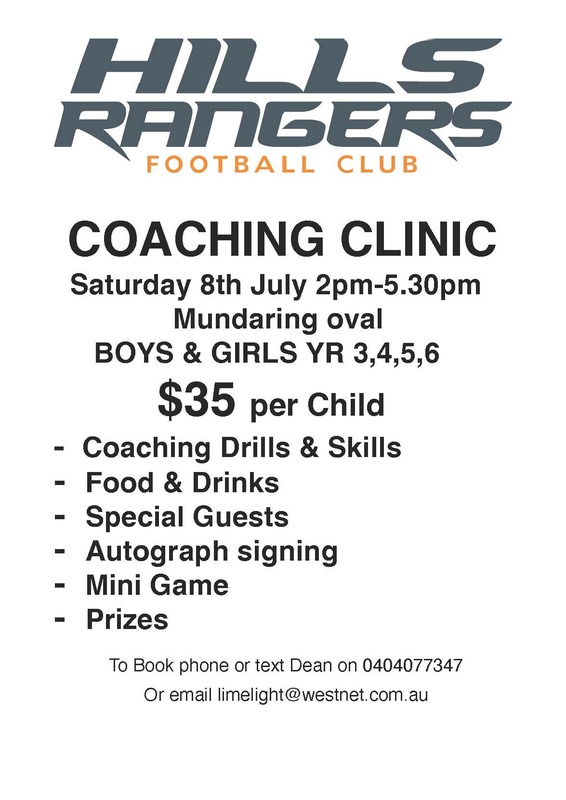 1 hour clinic supported by Swan Districts Football Club with games to follow clinic (modified rules) – 10 minute halves. Skills stations with games to follow the clinic (modified rules) – 10 minute halves. This is a FREE event which includes a sausage sizzle, bouncy castles, AFL inflatables, music and much more so bring the whole family along. Gutted the season is over and interested in playing a little more football! AFL 9s is fast approaching. The game is modified rules, 9 per side and non contact. Age restrictions apply (16+). Games will be played at Mundaring Oval on Wednesday nights and the competition will run for 8 weeks, from 11 October to 29 November 2017. There will be a female, male and mixed competition so something for everyone. Come and see some early September finals action with our very own year 7 Orange team playing against Bassendean on Saturday 9 September at 2.30pm – John Reid Oval, Forrestfield. 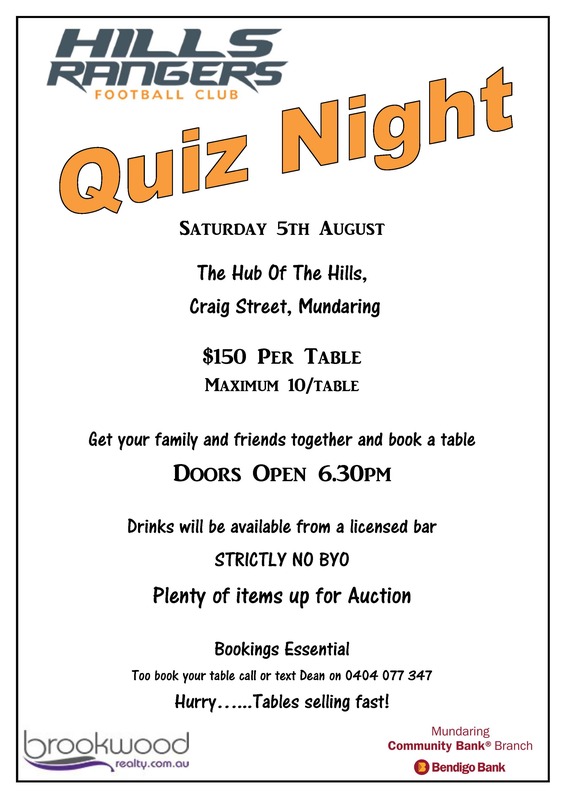 Don’t forget the quiz night on Saturday 5th August. Come along and support your club. We need your help with items for the raffle. If you have anything to donate, please take it to Sawyers Valley on any training night. The Hills Rangers are looking for a volunteer to take on the role of Registrar in 2018 . To assist with our succession planning, we are asking for expressions of interest from our current member group. The ideal person will have a handover and assist with the Round Robin in 2017 (commencing end of July/Aug for approximately 4 hours work to assist with registrations from junior clubs). This will assist with stepping into the role fully in 2018. Download the job description below for more information. If you are interested in the Registrar role please contact Robyn on secretary@hillsrangers.com or m: 0438 386 848. 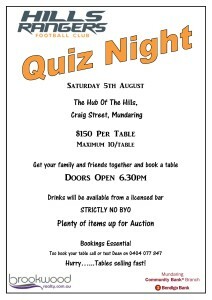 Come along and join the fun !! Only $15 per person on a table of 10. Congratulations to the WAFL State team and our very own Year 10 coach Tony Notte who helped WA break a 113 year old drought by smashing the VFL in Melbourne on Saturday for the first time! Tony had a fantastic game including an absolute screamer during the game. 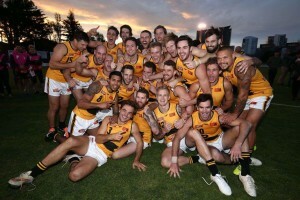 Well done to all the boys and well done Tony!